The format for the tournament is "round robin/pool play" with a minimum 3 game guarantee. Please note that your age (age group) will be determined by the age you are on January 1, 2019. Spectator Admission (full weekend pass) is $5.00 per adult and $3.00 per student and senior citizen. Athletes will receive a Nutmeg State Games non-numbered souvenir t-shirt for all players on the roster. Teams will be allowed to wear their own (numbered) uniforms / jerseys for the tournament. USA Inline Hockey Rules as amended by Nutmeg State Games Administration & Coordinators. Admission to watch the tournament (full weekend pass) is $5.00 per adult and $3.00 per student and senior citizen. Two 12 minute periods, stop time. One time out per game (30 Seconds). REQUIRED: Must wear cage helmet, street or roller hockey shin pads, elbow pads, hockey gloves. RECOMMENED: Mouth guards and shoulder pads or some sort of protection for the shoulders and chest. 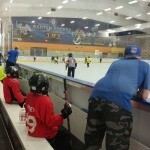 OPEN division is not required to wear a cage UNLESS the athlete is under the age of 18. If teams will be entering a team in the Gold & Silver Open Divisions they will have the option to share a maximum of three (3) players between the two teams. Teams are NOT allowed to enter the same team in both the Gold and Silver Division. Zero tolerance for profane language or fighting. Teams will play with four skaters and a goaltender; all players must wear skates. Teams are required to be ready 30 minutes prior to their game time, if we are running ahead of schedule, games can start ahead of the scheduled start time. Teams are to provide their own practice pucks. Teams will be allowed a maximum of 12 players and two coaches for credentials and awards. After a 7 goal lead in the 2nd half the clock will run. If a player receives three (3) penalties in one game (including misconducts) he / she will not be allowed to compete in the rest of the Game. If that same player receives three (3) penalties in another game he or she will be expelled from the tournament. Major Penalty- 5:00- Player is ejected for the remainder of the game, can return for the next game. Misconduct Penalty- 10:00- Player is ejected for the remainder of the game as well as the teams next game. 2 Major/ Misconduct penalties will result in an ejection from the tournament. Fighting is not tolerated during the Nutmeg State Games Tournament- Will result in ejection from the tournament. All teams are required to provide an official score keeper as part of their roster. We strongly recommend that the score keeper be an adult and must be present at each contest. The home team's score keeper will be the official score keeper for that game with the visiting team also keeping score as a secondary or back up score book. The official score keeper will sit with the administration and volunteers at the scorer’s table or tent during the contest. The score keeper is now part of your roster and will be treated as a member of your team. Behavior on and off the competition field by any person’s associated with the Games must follow the highest standards. Any participant’s behavior deemed in violation of the Code of conduct, as decided by the Nutmeg State Games administrative staff, subjects the competitor to expulsion from the Games.